Rural e-commerce initiatives fail to shake the impression that the countryside is backward and boring. China’s 400 million millennials are the most important demographic on earth and hold the key to their country’s future growth. Today, 18- to 35-year-olds account for almost one third of China’s population. The Brookings Institution — a U.S. based think tank — forecasts that their aggregate incomes will soon surpass those of American millennials, rising from $30 trillion in 2020 to more than $50 trillion by 2035. In addition to being big online spenders, Chinese young people are also innovative and tech-savvy, and they tend to desire convenience and independence more than previous generations. These millennials are fueling China’s current e-commerce boom — a phenomenon that is bringing great changes to rural China. The rise of e-commerce has provided rural entrepreneurs with new opportunities to establish viable businesses and revitalize their communities, which have been hollowed out by the migration of skilled laborers to urban areas. Online consumerism also has the potential to help traditional industries compete in a digital economy: Now families and villages can launch online shops and sell local produce to both domestic and foreign markets. This digital shift, in turn, may help staunch the exodus of rural workers. Consequently, both the national and local governments are promoting e-commerce as a way to drive growth in areas that have, up until now, missed out on the fruits of China’s rapid economic development. However, despite the sector’s growth, the population in many rural areas is still shrinking. These areas suffer from shortages of talent and skilled labor, and cannot compete with the high educational standards and diverse range of job opportunities that China’s cities offer. In addition, Chinese cities exert a powerful cultural pull on the country’s young people, who view them as exciting, cosmopolitan, and fast-paced when compared to life in the countryside. 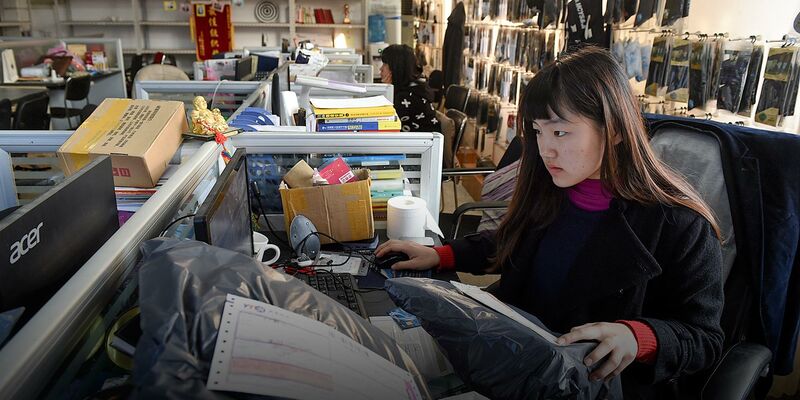 Officials generally attempt to incentivize young, skilled workers to launch e-commerce businesses in their rural hometowns by offering to subsidize land, workspace, and startup costs. They also try to sell potential returnees on the argument that they can spend more time with their families and contribute to the communities in which they grew up. Convincing young people to give up city life is easier said than done. Part of the lure of e-commerce is that it gives people more freedom to operate their businesses from wherever they choose — including the middle of the countryside. But if even after young people take up e-commerce they still remain unwilling to return to their hometowns, what can the government do? Yan Xiaoqian is a 25-year-old university graduate working in a technology park in eastern China’s Hangzhou City. She moved to the metropolis from Shangrao County in Jiangxi province to pursue higher education and develop her career. She says that although some people return to their hometowns after graduation, the majority choose to stay in urban areas. In her opinion, this is partly because young people see agriculture as the primary industry in rural areas and want to start e-commerce businesses that don’t focus solely on the sale of local produce. “I have a good friend who really wants to go back to her hometown, but only when she can actually do something for the area,” Yan says, adding that she sees her future as being away from her home village, where some young people have returned to sell locally grown grapefruit online. One of the biggest roadblocks in launching a business — even for online shops, which lack the overheads of physical stores — is finding startup financing. To support young people in starting their own online businesses, provincial and local governments now offer a wide range of subsidies and incentives, such as easy access to favorable bank loans. Jiao Peng, a graduate of Yiwu Industrial and Commercial College, is a successful rural entrepreneur who uses major online commerce platforms to sell locally grown apples from his hometown in the northwestern province of Shaanxi. He runs his business with his parents and says that rural entrepreneurship is a great alternative for young people who tire of the pressures of city life. While official policies and support programs can lessen the financial burden of establishing a rural e-commerce business, these incentives struggle to compete with the cultural draw of the country’s cities. Employment and financial success may be important to Chinese millennials, but they are not the be-all and end-all. Cities and urban areas offer these young people greater access to resources, networks, and — most importantly — a vibrant and fast-paced way of life surrounded by their peers. Despite the trickle of young Chinese returning home to the country’s less-developed areas — perhaps swayed by State encouragement — rural villages and remote areas are still losing population numbers. Officials — few of whom are millennials themselves — must understand that e-commerce is not a magic bullet to solve China’s rural-urban population divide, and that the shortage of skilled labor and the diverse wishes of millennials need to be fully understood if this generation is to lead China into the future.